I am not a glutton for punishment in games. I don’t usually enjoy dying over and over again until some mercurial mix of skill, experience, and luck finally combines to see me through to the next level. But I revel in the moments just before failure occurs, when I’m fighting for my life and the impossible still feels possible. Overwhelm is a game that nails that feeling perfectly. Overwhelm is a minimalist side-scrolling shooter that came out last June on PC and is now on Switch. Like any pixelated throwback game that’s infatuated with the ’80s, it has elements of Metroid and Mega Man, as well as pulsing synthy beats. It also has enough clever touches to make it feel perfectly at home in 2019. The object is to explore an underground hive full of deadly insects and exterminate them by collecting five gems needed to power a generator. Each gem is hidden in a distant corner of the map and guarded by a boss. 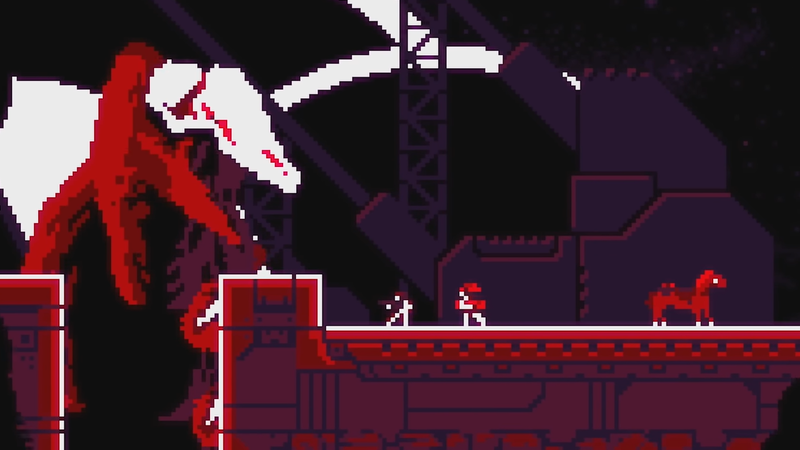 Once a boss dies, their special ability gets transmitted to the remaining enemies in the hive, ramping up the difficulty as you approach the end. On Switch, the game also has co-op so that players can face the onslaught together and revive each other when one dies. After beating a boss, you can choose to start there the next time you respawn. Overwhelm isn’t a long game, but you die in one hit and only have three lives. While these lives are restored after beating one of the bosses or returning the gem to the starting area, it’s still incredibly easy to let your guard down and bite it, especially as the hive’s threats begin to multiply. Still, I find myself continually drawn back into Overwhelm’s hellish underground, despite numerous deaths, in part because of how every bit of its cruel gauntlet oozes with energy. At times, it feels like Dead Space, if Dead Space were made on the Atari and took place inside an alien rave. Overhwhelm is enthralled with the horror it presents, and celebrates it, rather than deploying it like a cudgel to pacify the player. The double jumps are snappy, the aiming precise, and the plasma blasts thick and crackly. The soundtrack, sometimes nearly silent, at other times jacked up to 11, is relentless in a way that hypes me up rather than filling me with dread. I’m not supposed to want to die down there in the hive, but I can’t help but get a thrill out of it. In the spirit of its title, Overwhelm cuts off your peripheral vision when you’re on your last life, hiding the edges of the screen in a dark cloud. It makes it harder to shoot enemies from afar and easier for them to kill you if you leap too far while trying to evade them. Rather than encouraging you to submit to death, this feels more like the game’s way of egging the player on. I can’t help but feel like, despite all of the ways Overwhelm has to kill me, it’s secretly rooting for me to succeed.